Lizzy Parks' gloriously soulful debut single on Tru Thoughts is expertly produced by Ben ‘Nostalgia 77' Lamdin. Stunning live musicianship combines with a traditional approach to recording, using vintage instruments and microphones, and Lizzy's amazing voice full and vibrant at the front of the mix. On the flip, you'll find "Raise The Roof Part 2", a groove outro. The song was originally formed from 2 totally separate ideas that happened to sound amazing tog! ether. The digital release of this single will feature an additional track, "Prayer" as the B Side. Watch this space, as her album will be out in September. 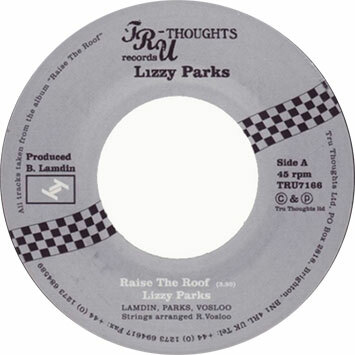 "Raise The Roof" is the gloriously soulful debut single by Lizzy Parks on Tru Thoughts - expertly produced by Ben ‘Nostalgia 77′ Lamdin and with rich, dramatic orchestration from Riaan Vosloo of the acclaimed Nostalgia 77 Octet. Stunning live musicianship combines with a traditional approach to recording, using vintage instruments and microphones, and Lizzy's amazing voice full and vibrant at the front of the mix. Lizzy Parks' forthcoming album marks the first time that Ben Lamdin has produced a full solo LP for another artist and this record is set to bring her extraordinary talent into the limelight once and for all. Another rising star who featured alongside Lizzy on the latest Nostalgia 77 LP ‘One Offs, Remixes and B Sides' was then-little-known Beth Rowley (Universal) - just before she hit the big time with her top 10 debut album earlier this year. An engaging and charismatic presence both live and on record, Lizzy often graces the stage as the live chanteuse for the Nostalgia 77 Octet and has worked with other great musicians including The Heritage Orchestra (Brownswood) and Chris Bowden (Ninja Tune).